If you have even a glimpse of an interest in mechanics, home machining or small machines, this book will blow you away. If you have an interest in watches, clocks and time keeping movements, you will be mesmerized. George Daniels is one of the rare few in the world who can produce a complete watch entirely by hand. His book, Watchmaking, details specifically and accurately how simple machines and tools are used and how watch parts can be formed. Colour photos cover many pages with hundreds of detailed drawings explaining how techniques are carried out or how parts work and interact throughout the 409 pages! When I first had an interest in watches and clocks near 10 years ago now, this book was ludicrously expensive and difficult to acquire. In 2011 the 3rd Edition has been released and although many people almost waited over a year for theirs to arrive, they seem to have finally copied enough to meet demand. I have however been informed that stocks are already dropping! This book is well worth every penny and I only wish I had it right back when I started machining. The information is invaluable if not more so the diagrams. Let me know if you do purchase a copy or already have a copy. This really is the bible for any potential watchmaker and would be a book of real interest to any machinist. Chris..I have the 1981 "first edition" which was published by Sotheby. I agree with you that it is a fantastic book. However whilst the operations are very clearly described, as we can all appreciate, the trick is have the skill/dexterity/feel to do them. George Daniels is an outstanding craftsman and I can only admire his work. Like you I have repaired a few pocket watches and clocks, but unlike you I have not made one from scratch. I have a collection of marine chronometers and deck watches (both used for navigation before the advent of quartz clocks and GPS). As they are irreplaceable, they go to a 70-year old master clock-and-watch maker for service / repair. His skills are remarkable, but are aided by having the right equipment that enables him to manufacture any parts should the be necessary. With watches in particular, the best solution is always to buy the replacement part where possible. I spent nearly 4 hours solid reading the book last night instead of working on my clock. I`m nearly at the end and I`m looking forward to reading it through a second time! With regards to skill, Daniels shows you the methods that need to be employed and with practice and practice I`m sure the skills can be gained. I had only 1% of the knowledge I have now and 0.01% of the skill I have now when I first joined this forum. OK, I`ve used books as well but mainly from people I have met and madmodder I gained the knowledge and only through practice I`ve got the skill. Daniels suggests methods and procedures that I`d never have thought of, I`ll gain the skill, dexterity and feel from practice. I`m just making the point that the book is stuffed full of methods and knowledge but I do agree and understand that you need to "find" the skill for yourself! Just through reading your never going to build a watch. I`m certainly not in any rush, I have to have success in this gearless clock and then I`ll move onto Colin Thornes clock and complete them. If I can`t finish a clock I`ve no chance. There are still a few engines in me, the elbow engine and an LTD ringbom I still feel I can make. I am seriously considering one day in the next few years embarking on the build of a Tourbillon pocket watch. There is enough knowledge in this book alone, plus info on the internet that I feel I could learn the "know-how"! As you said, the skill to make such a watch perhaps will prove too difficult! Chris...I agree with you completely - the only way to master anything is practice, practice and more practice. For some of us, eyesight and manual dexterity can be a limiting factor on working with small stuff (i.e. watch parts). Having said that, Bogs is but one example of how you can adapt your workshop set-up to cope with your circumstances. In my experience without some previously learnt skills you cannot as a rule read how to do something and then do it 100% first time. As one with limited formal workshop training (4 weeks, many years ago) I have found great value from books/articles/posts written by those who have done something and shared their thinking, methods of work, and often most importantly their mistakes! As you, and many others on this and other forums have illustrated, the only way is to give it a go and carry on, learning from one's failures. I value this forum for the genuine encouragement members offer each other and for the sharing of what they are busy with. I have little time for the "armchair engineers" who can describe it all in theory but never or seldom make anything! Do you agree with me that this book is an excellent read for anyone interested in engineering and small "machines" ? ..... or am I just writing with watchmaking blinkered glasses? Chris...What blinkered glasses? Judging by your posts, you do have broad interests! If you have some experience it is a good read, particularly if you are interested in making/repairing clocks & watches, barometers, instruments etc. since the tools and techniques described in the first 6 chapters have wider application than making/repairing watches. I have a Bergeon watchmakers lathe and, as a rank amateur seeking detailed explanation of an operation, I found that George Daniels was more useful to me than the UK standard work by Donald de Carle's "The Watchmaker's Lathe" or the Swiss equivalent H. Jendritzki's "The Watchmaker and his Lathe". However for general engineering the average beginner is better off with works from the 45-odd volumes "Workshop Practice Series", or books like Lawrence Sparey's "The Amateur's Lathe". Ohh yea, it certainly isn`t going to be the bread for any beginner but I just think it is amazing! I really really would like a proper watchmakers lathe but they are just too expensive. I`ve just recieved a jacots pivot polishing lathe which is lovely, but only useful for the one main job of polishing - I`ll post it up on the forums soon. 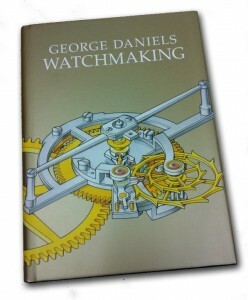 I have De Carle's - "With the watchmaker at his lathe", "Practical Clock Repair", "Practical Watch Repair" and i`ve never read it, but I`ve also got his book "Complicated Watches and their Repair" - all very good but Daniels book - "Watchmaking" is just at another level!! Look out for Boley lathes on ebay Chris. On your recommendation and the comments by others in this thread I have bought 'the book'. To be honest, I too am just blown away by the hardback form, its actual size, and its contents of over 400 pages of extremely detailed engineering, machining, fixture holding, and techniques, with illustrations, of machining and preparation of simple and complex forms. Unfortunately, I will be away from my workshop for at least a year while working overseas, but this book will accompany me. From just the very few pages I have read, it is well worth while. Yes, I am trying to build a clock, and it is proving to be a rewarding but challenging assault on my limited skills. I have completed only the plates, the plate spacers and the dial so far of a Strutt Epicyclic.....the next phases will be the gear cutting, and I really want to read the book before hand . Bry, Boleys are too expensive for me sadly. I have been offered a lorch at £250, flat bed model but it is 500mm bed length and 60mm width, taking 10mm collets. This to me still seems like a tool makers size, I know I often see the 6mm and 8mm boley collet lathes for sale and presume they are more suitable. Allan - you`ll have to post some pictures of your clock (I don`t think I`ve seen any!) I`m gad you like the book. My review was honest and I still feel the same about it, the book still just blows me away. I only wish I was touting for sales and I was a relation to George Daniels!! Good luck with your build and hope the book is a worthy companion on your year out. Keep us informed of your progress. Crikey, Amazon £28 now. I had mine on order for ages maybe 9 months and when it arrived a few weeks ago I too was blown away. It is a FANTASTIC book and I didn't begrudge the £40ish it cost me. How can Amazon now be offering it for £28 i'm tempted to buy another and stash it for either a present for a deserving chum or wait til I@ve worn out my expensive copy. i've had a flick through and my first impressions are if you make 'small' things then it's a good book. For most model (or larger) engineering though I don't think it's particularly applicable. A lot of the techniques we'd use don't seem to be mentioned and a lot of the methods mentioned are unlikely to be much use. Obviously all imo and based on a superficial flick. Chris, If you like books you will not be disapointed with http://www.amazon.co.uk/Wheel-Pinion-Cutting-Horology-Historical/dp/1861262450/ref=pd_sim_b_3. A top book. As you are a lover of tick toks, ithought you may be interested in a project i have had simmering for the last 31 years !!!. In 1980 i started a business dealing in fibre optics, and recalling an old BBC countdown device, i wonderd if i could make a clock that used fibre optics as a new way of showing the time. I worked out how this could be done,but at the time i had neither the time or the means to do anything about it, i did however tell anyone who would listen all about it. In the early 90's i built a prototype,then once again the job was put on the back burner. I finaly got around to making a start on the real thing when i reached retiring age (6 years ago), i had it about half finished, when i read about John Taylors Chronophage !!!! I WAS MAD. The chronophage uses led's to show the time in a similar way, (allthough not as well) as my idea. Well at that point i lost interest somewhat, and have only recently taken another look at the thing. NOW, to the point. I thought that, as you do'nt live a million miles away, if in the unlikley event you find yourself at a loss for something to do,you may fancy a trip over to cast a young fresh pair of eyes over the job. My loveley wife makes an excelent brew, and i am sure you would find the trip very usefull. If this idea has any appeal, then send me a pm sometime. I live about 1 mile from Bogs to give you an idea of distance from you I look forward to hearing from you. PM Sent. :-D Sorry, I`ve been on holiday and must have missed this thread! I used to repair watches as a hobby, I bought a parts cleaning machine and used to strip them, Cleant the parts and relube as I built them back up! I still replace cells in watches and springbars for friends and family but nothing more delicate or involved!! I have several books too somewhere!! 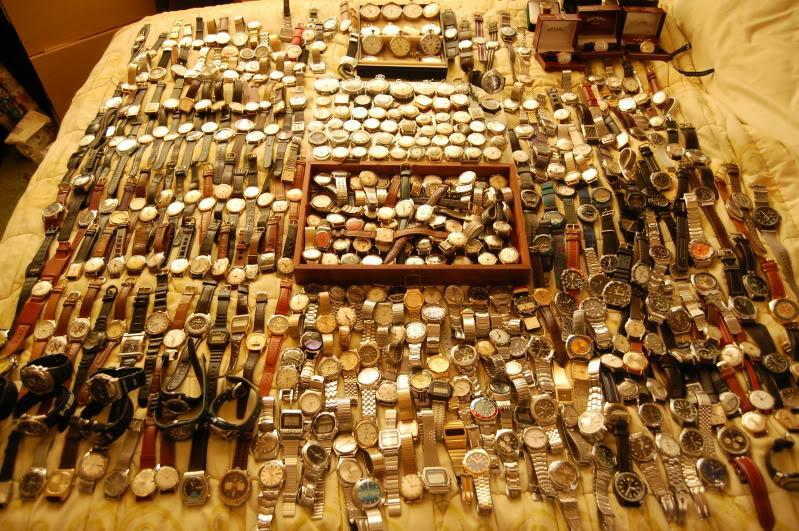 By the way, I've collected watches for 42 years and have between 2,500 and 3,000 of them!! This is much less than half of them although quite a lot are broken, I used them for donor parts for watches that shared the same movements!! George Daniels lived here on the Isle of Man for many years and had his workshop in the North of the island. 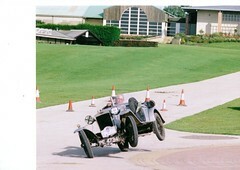 He also had a great passion for vintage cars,and was frequently seen competing in local car racing events driving his blower Bentley. Roger Smith was George's understudy,and he is now resident here and a seriously gifted watchmaker. Many donkey years ago (and even more dog years), sometime in the late 1970s, I acquired one of Dad's old broken digital watches. Rather fantastically, for the time, it was a digital solar powered watch! Unfortunately, the rechargeable battery was shagged, and even if the watch was left under bright light for many hours, it would only work for a short period of time before the cell died. Eventually, I managed to explode the battery trying to recharge it on my train set controller! It made a hell of a bang, as I recall, for such a tiny little thing.... Anyway, some time after that the watch itself was lost, never to be re-found. So... question, of your thousands of watches, do you have many mid-to-late 1970s solar powered examples? I've been trying to find a picture, because I'm fairly sure I'll recognise it when I see it, but nothing's ringing any bells. I was fairly sure it was a Casio (but I've since found a picture history of every Casio watch ever made, and it's not there), and I'm reasonably sure it had a black face with a stainless steel body & strap. There were 3 small solar cells in a line above the digital readout. I don't recall if it just did time, time/date, or time/date/alarm. I'm moderately sure it didn't have an alarm. Have you got anything in your collection which might match that description? If you like books on making watches then the guy who runs this website and has lots of Youtube videos has an amazing book. Very limited copies and the price reflects that but certainly one on my Xmas list. Which Xmas who knows. I sat for hours watching all his YouTube vids. I have the George Daniels book and have to agree it is a really good read and well worth the price. I had a later 70's Seiko that fits that description.